Available in both ebook format (for immediate download), or get the ebook free when you buy a printed copy. Premium subscribers are eligible for a 20% discount: enter coupon code premiumbooks upon checkout. 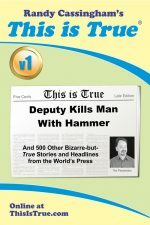 The second book in the This is True series contains more than 500 True stories and headlines from July 1995 through June 1996. 155 pages, 5.5×8.5″. This is the new design of the series, with updates throughout and the new cover. Each volume of the This is True collection contains a full year’s worth of columns from This is True, plus many extra stories that didn’t make it into the column — newspapers have a strict space budget which Randy must adhere to, but sometimes there are just too many fun stories he can’t help but write about. You haven’t seen them all even if you’ve read every column online or in the newspaper. 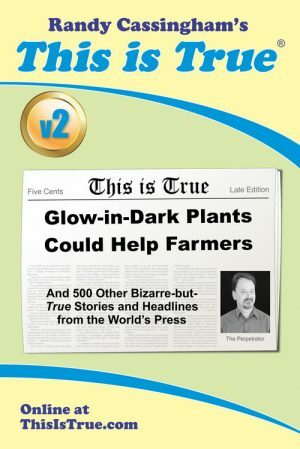 There are more than 500 True stories and headlines in each! And these are no cheap pulp paperbacks. They’re “trade” (high-quality) paperbacks with stay-flat, laminated, color covers. This is True books make a great gift. Our attention to quality makes your gifts all that more appreciated. The quality is so high, we’ve never had one returned under our better-than-risk-free satisfaction guaranteed policy! Also, don’t forget that Premium subscribers get a 20% discount on books — no limit! Your discount could pay for your Premium subscription. You may order discounted books at the same time you order a Premium subscription. Free shipping is by media mail to USA. Also Available Via Amazon in paperback or value priced on Kindle. ©1994-2019 ThisIsTrue.Inc, All Rights Reserved worldwide.